Legal marijuana businesses should have access to banks as a matter of public safety, says a new bill proposed by US lawmakers. 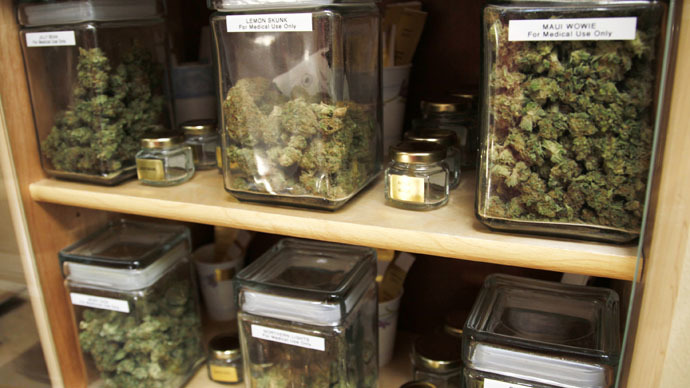 Currently the legal pot dealers in 21 states operate on cash basis, making them a target for thieves. Banks are currently banned from doing business with any marijuana sellers, even if they are licensed by the state, because doing so would be a violation of federal law. Marijuana is still listed under Schedule I of the Controlled Substances Act. This means licensed dealers in states that have legalized the drug cannot access the banking system to accept credit cards, deposit their revenue, or write checks to pay taxes or wages. House Resolution 2076, proposed by Representatives Ed Perlmutter (D-CO) and Dennis Heck (D-WA), seeks to change that, with lawmakers arguing this is in the interest of public safety. “The federal government can’t keep an eye on business practices if they are forcing them offline and underground,” said the bill’s co-author, Dennis Heck. “Forcing legitimate businesses to operate on a cash-only basis without bank accounts is an invitation for robbery, tax evasion and organized crime." Colorado and Washington are among the 21 US states, as well as the District of Columbia, that have legalized marijuana possession or use to some extent. A recent Pew Research Center survey showed that 53 percent of Americans support legalizing marijuana. Support runs as high as 68 percent among the young adults aged 18-34. Advocates hope the promise of added revenue from legalization would help change the minds of reluctant lawmakers. Perlmutter and Heck’s “Marijuana Businesses Access to Banking Act of 2015” aims to revive the bill submitted in 2013 that never made it to the House floor for a vote. House Resolution 2652 had 32 co-sponsors, 29 Democrats and 3 Republicans. The “reboot” of the bill has only half that many lawmakers backing it, with Rep. Mike Coffman of Colorado as the sole Republican. Govtrack.us gives it a one percent chance of being enacted.